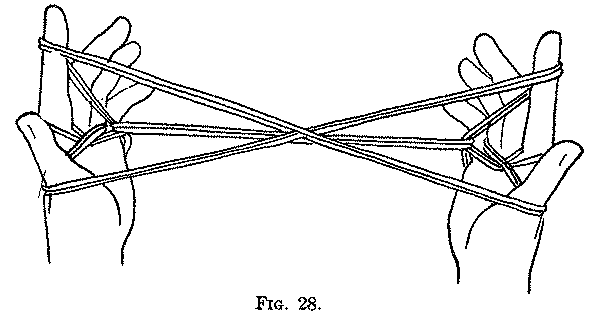 This figure was taught to me by Dr. Haddon in August, 1904. He obtained it when on the Cambridge Anthropological Expedition to Torres Straits; it is described by Rivers and Haddon (p. 150). In Mer (Murray Island), Torres Straits, it is called Ares = Murray and Dauar men fighting. One twisted loop of the finished figure represents the Murray man, who always carries off the Dauar man’s head. Second: Bend each little finger toward you over all the strings except the near thumb string, and then down into the thumb loop, and pick up on the back of the little finger the near thumb string (Fig. 22), and return the little finger to its original position, taking the thumb loop entirely off the thumb. You now have a single loop on each index and two loops on each little finger (Fig. 23). Third: Pass each thumb away from you under the index loop, and take up from below on the back of the thumb the two near little finger strings, and return the thumb to its position (Fig. 24). Release the loops from the little fingers. 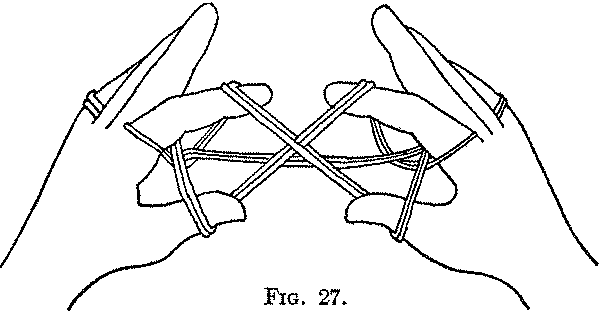 Fourth: Bend each little finger toward you over the index loop, and take up from below on the back of the finger the two far thumb strings (Fig. 25, Left hand), and return the little finger to its position, retaining the loops on the thumb (Fig. 25, Right hand). Fifth: In the centre of the figure there is now a distinct triangle formed of double strings (Fig. 26). Insert the tip of each index from below into this triangle, and, pulling out the sides of the triangle on the backs of the index fingers (Fig. 27), separate the hands. You should now have two loops on each thumb, two loops on each little finger, and three loops on each index, one at the base of the finger and two together near the tip (Fig. 28). Sixth: Keeping all the strings securely on the right hand, with the right thumb and index lift the lower left single index loop over the two upper left index loops (Fig. 29), and over the tip of the left index, and let it fall on the palmar side. In doing this movement be careful not to let the loops slip off the right fingers. In like manner with the left thumb and index remove the lower right index loop from the right index. Release the loops from the thumbs. The two loops which are now on each index and little finger are bound together not far from the palm (Fig. 30). Seventh: Twist tightly the two loops on each index finger about three times, by rotating the index away from you (or by dropping the loops from the index and twisting them with the thumb and index). Eighth: The loops should now be dropped from the index (if this has not been already done to twist them with the thumb and index) and the figure turned so that these twisted index loops shall hang down. 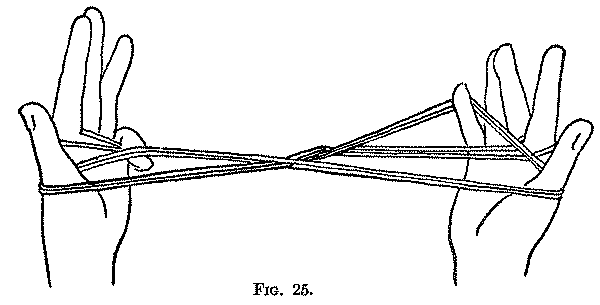 With the left little finger pull gently on the left near little finger strings, which will cause the right twisted hanging loops (one head-hunter) to move toward the other hanging loops (the other head-hunter) (Fig. 31); then they meet, and by jerking the left hand strings slightly "they fight and they fight and they fight." The result of the contest is always uncertain; either "they kill each other" and fall apart, or "one may kill the other and travel home," toward the right hand, "with his enemy’s head" (Fig. 32). If, in forming Opening A, the right palmar string be taken up first, and if, when the figure is completed, the right near strings be pulled upon, then the victorious head-hunter will travel home toward the left hand. There are not many figures like this one which have definite stories attached to them. Doubtless the stories exist, but have not been told and recorded; in some instances the stories have been forgotten by the natives themselves, or have degenerated into formulae the meanings of which are no longer known. The Fighting Head-Hunters is a good example of that simple type of figure in which most of the movements consist in passing the fingers away from you and toward you, and taking up strings and loops from other fingers of the same hand. The picking up of the strings forming the sides of the central triangle is not a common movement. In the Second movement a loop is transferred from one finger to another and turned over during the transfer. In the Sixth movement we have the first example of an almost universal procedure: When two loops are on a finger the lower loop is lifted over the upper loop and off the finger to form, toward the centre of the figure, a running noose or ring upon the upper loop. 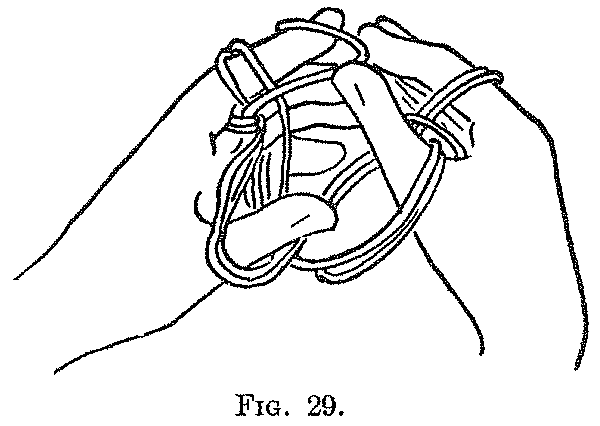 If there be three loops on a finger the lower one may be lifted over the upper two, or the lower two over the upper one, but in all cases the principle is the same, namely, to thread the upper loop, which originally belonged to another finger, through the lower loop, which is usually the original loop of the finger. As we shall see further on, this movement is executed in different ways: with the teeth, with the thumb and index of the other hand, by the aid of another finger of the same hand, or merely by twisting the finger itself. It is so general in the Navaho Indian figures that, following Dr. Haddon, in conversation we often speak of it as the "Navaho movement," or, coining a new verb, direct that the loops on a finger shall be "Navahoed."